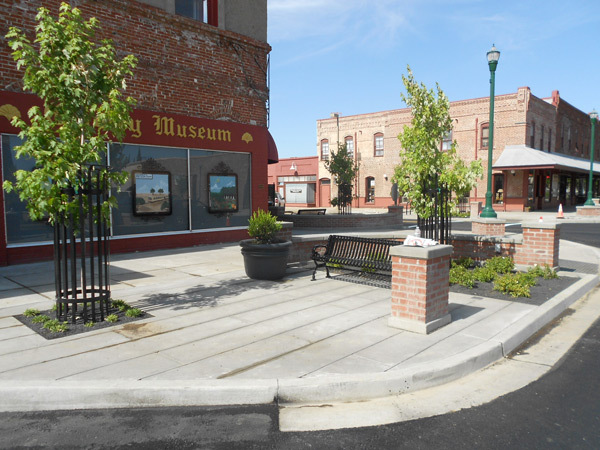 The attached photos and master plan are for streetscape improvements in downtown Gridley, CA. Original plans called for brick sidewalks and crosswalks but value engineering turned the brick sidewalks into a 4’ square pattern to match the existing walks. Crosswalks were kept standard. 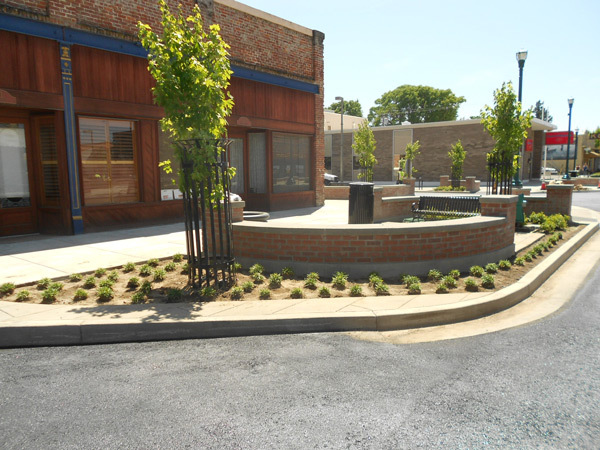 Unique streetscape elements include the bulb out corners for pedestrian space, curved brick seat walls and columns with black site furniture accents; kiosk, benches, plant containers, bike racks, tree guards, antique street lamps and a few items that are about to be installed; decorative steel railing in between with columns, historic steel bollards and replica historic steel base for the stop signs on top of columns. The concrete in the bulb out areas is scored in a basket weave pattern and all site concrete is antiqued to look as if it was always a part of the historic downtown. Planters are finished with a local black crushed rock used in planters to as an accent color and to limit maintenance. See our interview on BayAreaForSale.com, a top site for California homes for sale, Florida real estate, S. California real estate & San Francisco, CA real estate: How to Create the Perfect Outdoor Room. I had a chance to see the initial stages of the transformation, can’t wait until next time, I’m in Gridley to see the completed project. Nice work!